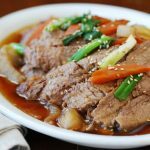 This slow cooker version of a Korean chicken soup is so easy to make! It’s called dak baechu guk (닭배추국). 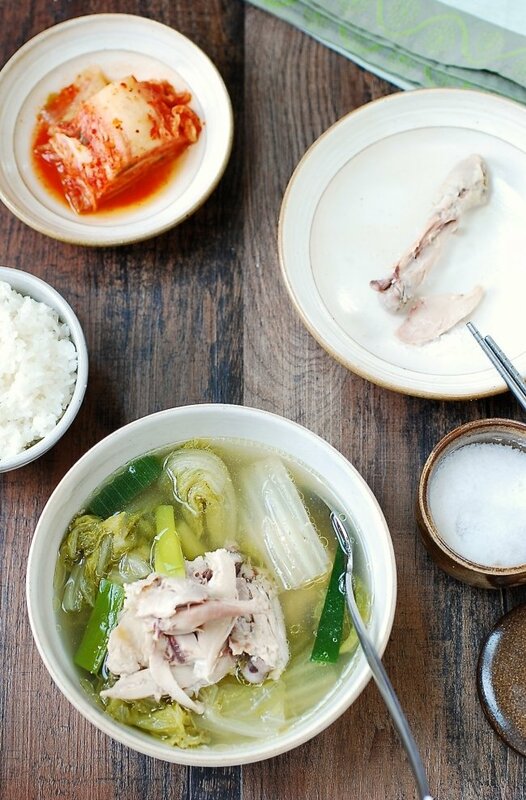 Dak (닭) is chicken, baechu (배추) is napa cabbage, and guk (국) is soup. Baechu guk is usually made with beef broth or anchovy broth, and sometimes flavored with doenjang (fermented soybean paste). It also works very well with chicken broth! I often use a whole chicken cut up, but you can use any (or any combination of) chicken parts you want. When I don’t use a whole chicken, I use bone-in, skin-on thighs and legs. 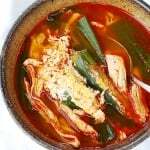 They stay tender through long, slow cooking and add richness to the broth. That doesn’t mean you can’t use skinless chicken breast if you want a lighter and cleaner soup. 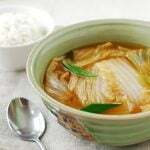 I really love the soft, sweet napa cabbage in this soup. Use an ample amount of the large, thick outer leaves. They cook down quite a bit, but hold up pretty well to hours of slow cooking. 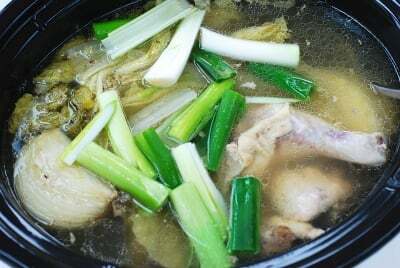 I like to serve up the soup as is along with dipping salt on the side, but you can remove the bones from the chicken pieces and shred the meat and add back to the soup to serve. It takes minimal effort to put together the ingredients. The slow cooker does the rest to create a flavorful soup with tender chicken and soft vegetables! 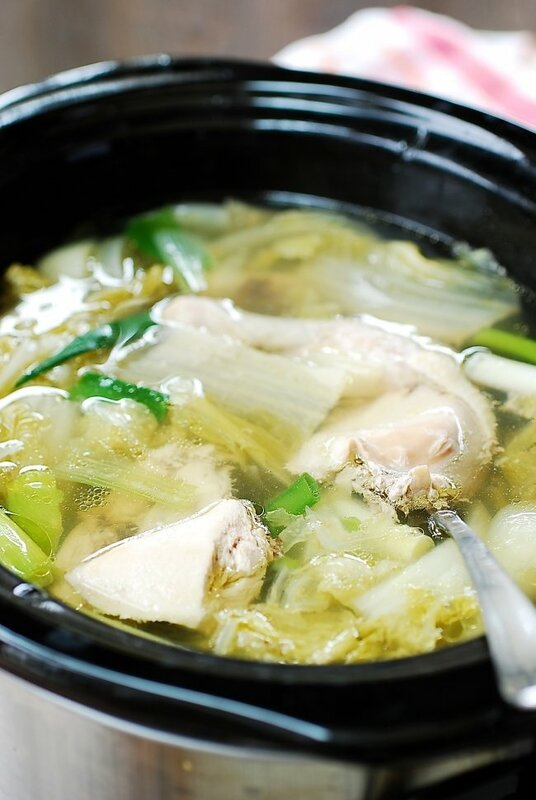 This slow cooker version of a Korean chicken soup is packed with tender chicken and soft napa cabbage! 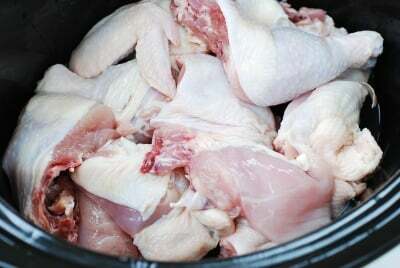 Clean the chicken, trim off excess fat and place in the slow cooker. Roughly cut the cabbage leaves into big pieces. Cut the onion into 4 big wedges. 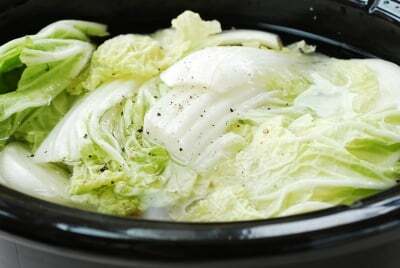 Add the cabbage, onion, garlic, and ginger to the slow cooker. Add water to fill up to 2/3 of the slow cooker (about 8 cups). Add 1 tablespoon (2 teaspoons if using very fine salt) of salt and 1/4 teaspoon pepper. Cover, and cook for about 4 hours on high or 6 hours on low. Cut the scallions into about 2-inch length pieces, and drop into the soup, with a few minutes remaining. Add salt and pepper to taste. Remove the excess fat. You can spoon off the fat, or use a fat separator. 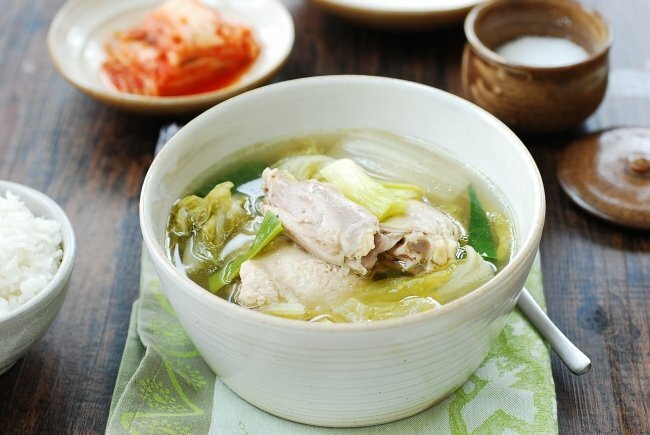 You can transfer the chicken and vegetables to another pot, and strain the broth if you like cleaner broth. 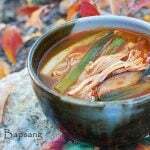 You can use the leftover napa cabbage for another soup - Baechu Doenjang Guk. Sounds very yummy! Can this be done on a stovetop instead of slow cooker? Thank you! Yes, you can do this on a stove top. Boil everything for about 20 minutes. Can you use cornish hens instead of chicken pieces? yes! It should work fine. Looks very nice. Do you add hot or cold water ? 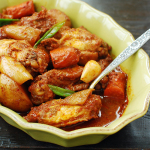 This is a lovely recipe and thank you for another slow cooker recipe. . I served some to my visiting brother last week and he told me that our grandmother used to make it for him whenever he visited her in Pohang. She would deliberately under season hers and would serve it with a small dish of salt to the side. Yet another remind of how food is so important to keeping memories and passing on culture. I’m so happy to hear this soup brought back your brother’s memories of your grandmother. Thank you for sharing your story! Hi, thank you very much for a delicious and simple recipe. I was blown away but how delightful the broth came out. Your instructions and measurements are really clear, which is very helpful to me! 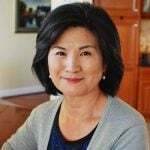 I can’t wait to check out more of your recipes. Hi Viviana — thank you so much for leaving me your feedback! It means a lot to me. Hope you find many more recipes to try! This came out so good! Thanks you for sharing this recipe. I love it! 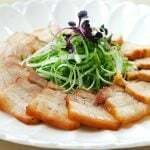 Can I add shiitake mushrooms to this recipe? If so, when should I add it & how long to cook it? Is it okay to add dried shiitake mushrooms to this recipe? When should I add it & how long do I cook it for? Thank you! I am a new convert to Korean cuisine since I’ve switched to whole foods diet. And I’m a wimp when it comes to spicy food. Thank you for sharing your expertise! !